For those families that are using or thinking about using Tapestry of Grace Year 2 plans, I have been documenting our unit celebrations as they have been completed. Sometimes we put a lot of work into the activities but our Unit 2 Celebration covering the Renaissance period of time was simple but yet lots of fun. I knew I wouldn’t have a lot of time to prepare so we chose fairly simple projects to include. This unit celebration was just for our immediate family. Even though it was really just their father and their siblings that came to view the projects, it still gave the boys a sense of accomplishment and finality to have their work on display for others to view. There were some great conversations as well as their siblings read over their work. 1. I made a display with some of their writing pieces from the unit. 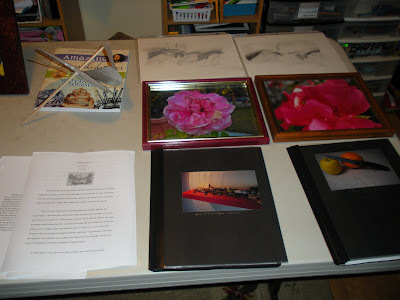 I put out their photography and art projects for all to view. 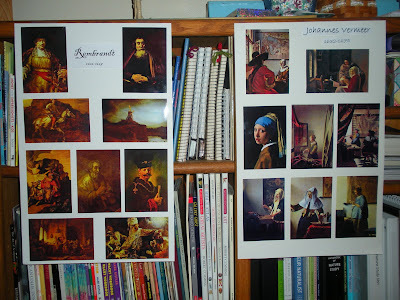 I hung up their Baroque artist posters along with the “museum guides” that went along with them. 2. 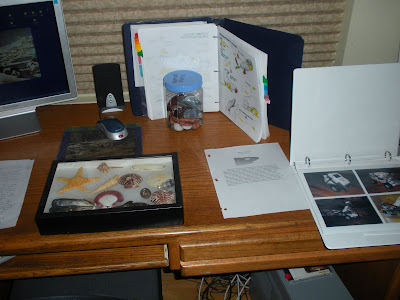 I made a display with their science binders, a few reports, their shell collection, and put out their robotics photos for all to view. After each person was finished viewing the work, I had a clipboard for each boy where they made a short written comment to each of the boys as a way to express what they liked about their work and projects accomplished during this unit. 4. 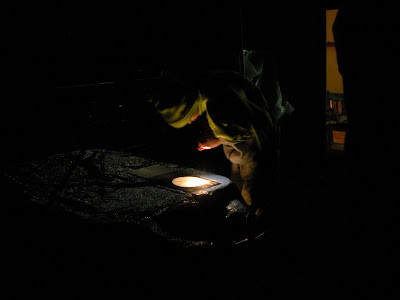 The boys had prepared a “reader’s theater” activity which consisted of picking a scene from one of the Shakespeare plays they read during the unit. They chose King Lear and then the first scene for us all to perform. They made up folders for each of use with a summary of the play’s plot, descriptions of the characters in the scene, and then a script for each of us. We all had parts in the reading. It was so much fun! 5. Afterward, we went outside for a little star gazing. We had a star chart in a book and we used that to try to find some constellations. The moon was super bright and so we didn’t have the best view of the stars but we were trying to see if we could all find the North Star, Ursa Major, and Orion’s Belt. We were successful and very cold. 6. Back inside again someone mentioned hot cocoa so we were all in the kitchen to enjoy a cup of steaming cocoa and some more laughs. A unit celebration for Tapestry of Grace doesn’t always need to be elaborate. In fact, I think this was one of our favorite celebrations that we have had so far. I will try to remember that when I am planning the next one. For a description of any of the art projects mentioned in this entry, here is a link that shares the plans for each one. What a marvelous thing to do…. I would have loved to come over and view all of their hard work…. Barb, you are so creative. I love this idea! I am hoping to borrow it as we finish up our second quarter. Would be a great way to show Dad what we’ve been up to. That’s wonderful–I like that they review and comment on the work. Gives me some ideas for our year-end celebration! What a great night! I am sure your boys felt honored having their accomplishments set on display for their family’s viewing pleasure.